September 11, 2018 (Last Updated: April 9, 2019) - As an Amazon Associate I earn from qualifying purchases. Portable Apple pie sounds like a really good thing, doesn’t it? These Tasty Apple Hand Pies live up to the expectation and a great way to make some delicious snacks for the family. 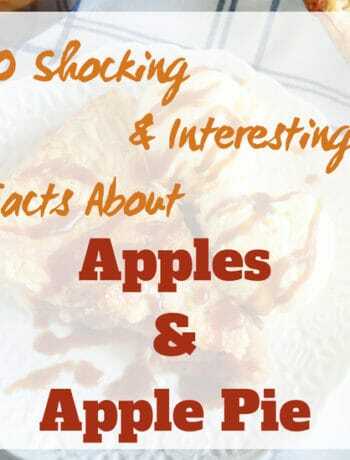 Ladies and gents, we now have been spending a while in our apple pie series and really have made some delicious recipes. Not only have we made a traditional apple pie, but a few different variations and today we are going to continue that trend. These Tasty Apple Hand Pies are delicious, portable, and have an awesome glaze on top that makes the whole treat pop. 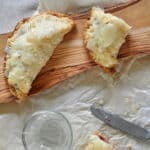 This is a great little recipe with some great comfort in portable pastries. 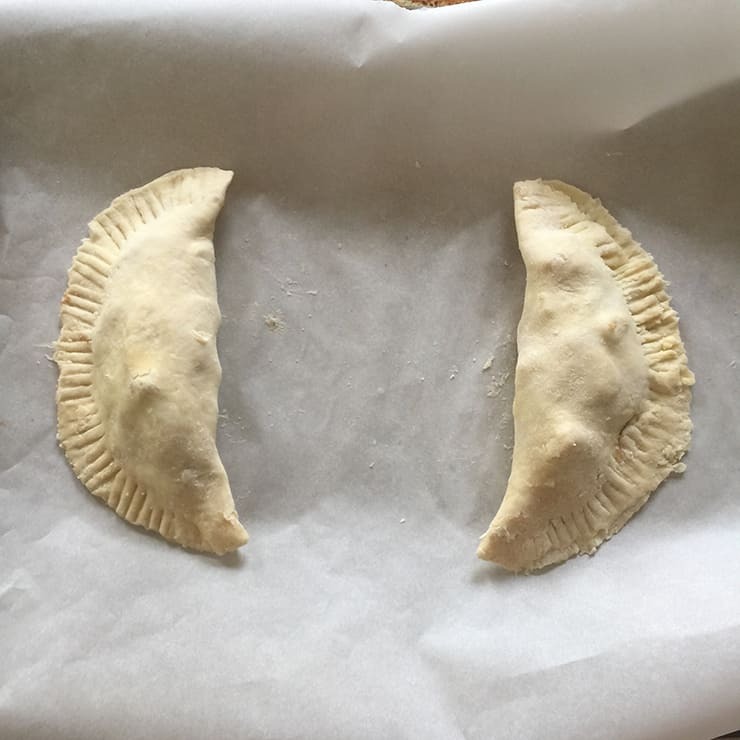 Join us, as we embark on this adventure of making, and sharing, our Tasty Apple Hand Pies. What is Great About Hand Pies? Well, that is a terrible question. 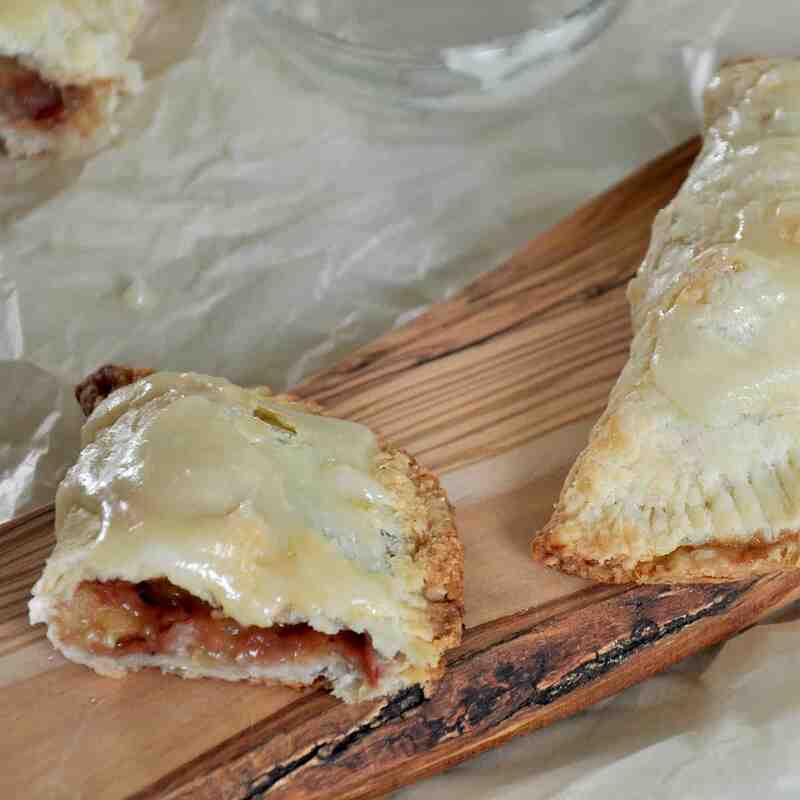 If you like fruit pies, you are bound to love these apple hand pies. Really, they are a great way to share some apple pie goodness with the whole family. Not only do they taste really good, but there are some really great advantages to hand pies over a traditional apple pie. Look at them. These little dandies were just meant to be carried around. Unlike a traditional apple pie that is really meant to be eaten on a plate, these hand pies were meant to be handled. The crust is all-encompassing and helps make this a spectacular treat when you (or your kids) are on the go. These are meant to be served individually. Not only do the containers (the cust) make it portable, it is packaged up into one nice little package for one person. Now, don’t be afraid to cut the apple pie in half and share. Despite what Mr. Rogers says, sometimes I don’t want to share, particularly when it comes to dessert. We have frozen a few of these to see how they would turn out. I will say that fresh is better, but they do freeze well. What does that mean for you? Well, you can make several at a time, plop them in the freezer, and let the family enjoy whenever they want a treat. However, be prepared for them to go quickly, anyways. We are using the same from-scratch pie crust that we used in our traditional Apple Pie. This butter pie crust is really flaky and super tasty. The only difference is that we only use enough dough that would be one disk in a traditional pie crust. We then divide that into two and roll them out separately. Unlike my pies, where I fit the crusts into the pan and then cut them to fit, I precut these so they are even. 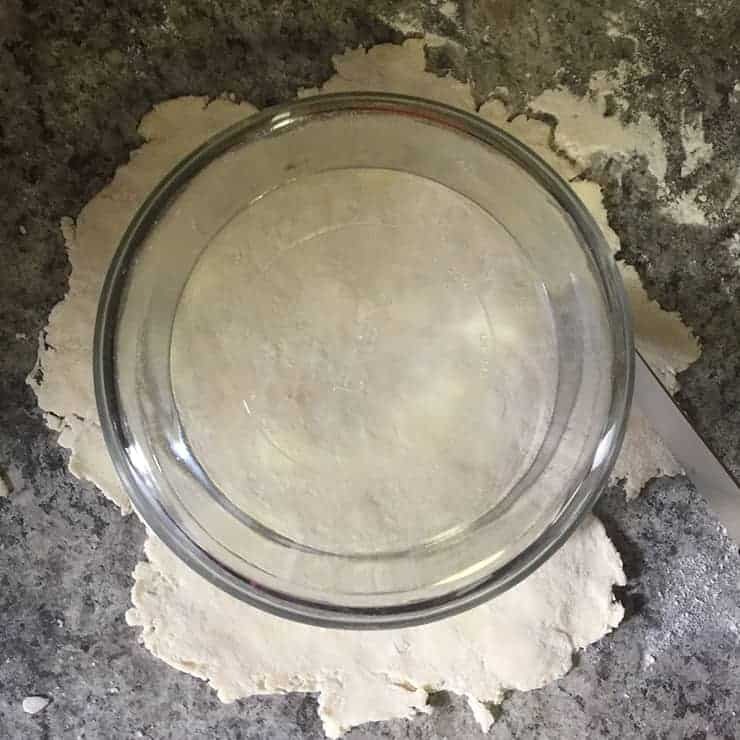 I was taking a pyrex bowl and placing the opening on the dough. 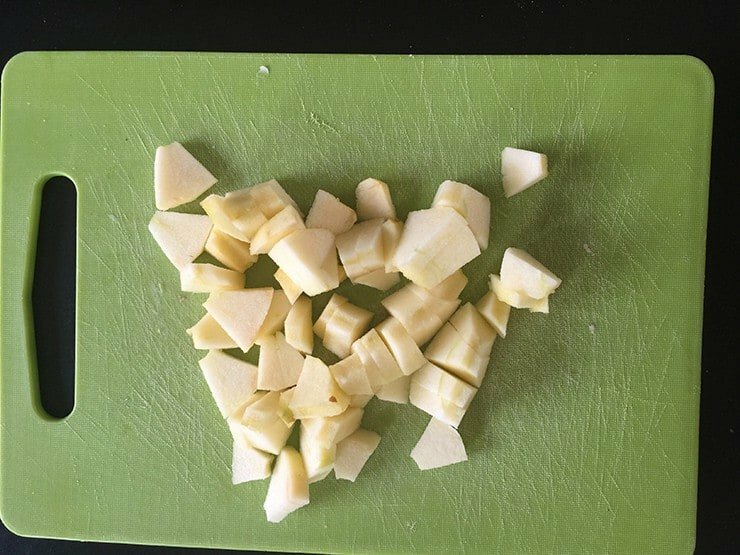 Using a knife, I then cut them out to be almost perfect circles. While perfect circles, we still have that great butter dotting of our pie crust that can make for such a flaky and tasty crust! I struggled with this one, a bit. Don’t fit too many apples into your apple hand pies. The deal is that if they are overstuffed, they become difficult to close and work with. For two hand pies, I only used one large Braeburn Apple. Really, I didn’t need quite that many apples and a few hunks ended going into my mouth rather than the baked apple pie. A medium apple is better for these purposes. Between the apples, the sugar glaze, and flour/sugar mixture on the inside, there is enough flavor in these apple hand pies. No need to make things difficult for yourself by overstuffing. What a tasty little treat. It is so simple to make this glaze but does require just a tad of attention. The amount of milk I use in my recipe is half of a teaspoon, but I suggest mixing all of the other ingredients, first. Then, slowly add the milk just a very little at a time and mixing. 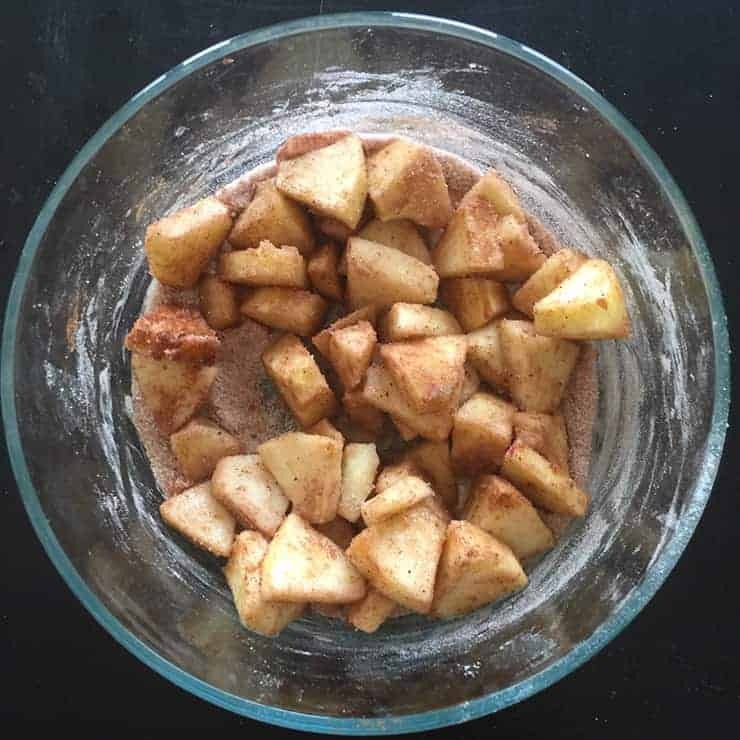 Eventually, and it might be before the ½ teaspoon, you will get to a very nice, thick sugar glaze for your apple pie. Also, don’t add the sugar glaze until your pie has cooled. There we have it! We have the recipe for our Tasty Apple Hand Pies. Give this recipe a try and let me know what you think in the comments section below. Also, be sure to subscribe to get updates via email and follow me on the Instagram. 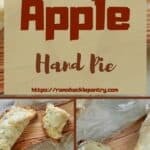 These Apple Hand Pies are a great snack or dessert that gives you a portable pocket of delicious apple flavors. The sugar glaze just adds a bit of extra awesome. I slightly reduced the calories based on there being 20% waste in the dough, as some will be cut away and some of the sugar glazes will drip off the hand pie. Check out our traditional apple pie recipe for more commentary and pics on making our butter crust. Note, this is a smaller portion size, but the techniques really are the same. All this time I thought hand pies were made out of chopped hand. Kind of creepy. And so hard to source. Would love an apple version. Haha…. well, I suppose they *could* be made from hands. Just, not in my house. Hopefully in nobody’s house. Your apple deep dive is amazing and I will be sad when it is over. These look incredible. Love me a hand pie.